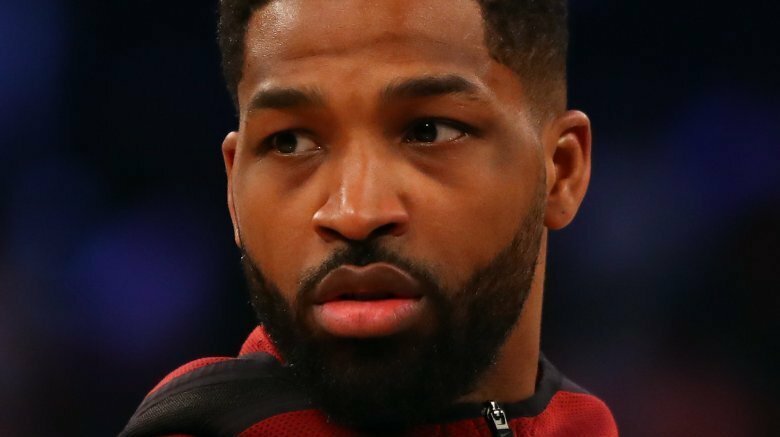 Tristan Thompson has been hit with another cheating allegation. According to an Entertainment Tonight exclusive, published on Tuesday, April 24, 2018, the Cavaliers star reportedly cheated on girlfriend Khloé Kardashian the night before her baby shower. As a source told the website, the Revenge Body star's friends and family aren't sure if there's any truth to this latest claim, which continues to put them in a difficult position. "Her friends and family are learning all these new details and it's hard to know what's just someone trying to cash in and what is true," the insider said. "It's tough to know what, if anything, to tell Khloé." "If a friend tells Khloé that they heard about another cheating story, they risk being cut off by her," the source continued. "She's stuck by her man in the past, so it doesn't even seem worth it to fill her in on all the details." As for Kardashian herself, she's reportedly remaining focused on the couple's baby girl. "She's not in a bubble of denial," the insider explained. "She knows what's going on and is still trying to process it, but so far, she's managed to move past it and look forward." As Nicki Swift previously reported, Thompson was caught on video allegedly cheating on Kardashian with multiple women just days before welcoming their first child together, daughter True. Since the scandal broke over two weeks ago, a number of infidelity rumors have surfaced, alleging that the NBA star had affairs with at least five women during the Keeping Up With the Kardashians star's pregnancy. According to another ET source, the future of the couple's relationship is reportedly uncertain as they're understandably "not in a good place" amid the ongoing scandal. "Khloé and Tristan continuing as a couple isn't a sure thing," the insider said. "Khloé is still upset over everything that came to light regarding Tristan, and is taking time to enjoy being a new mom before deciding the future of her relationship." Thompson, 27, and Kardashian, 33, who have been together since October 2016, have yet to publicly comment on the cheating allegations.